I've been busy trying to replicate the "eFail" PGP/SMIME bug. I thought I'd write up some notes. 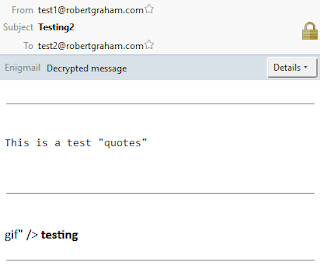 PGP and S/MIME encrypt emails, so that eavesdroppers can't read them. The bugs potentially allow eavesdroppers to take the encrypted emails they've captured and resend them to you, reformatted in a way that allows them to decrypt the messages. The correct defense against this eFail bug is to make sure such remote content is disabled and that you have no exceptions, or at least, no HTTP exceptions. HTTPS exceptions (those using SSL) are okay as long as they aren't to a website the attacker controls. Unencrypted exceptions, though, the hacker can eavesdrop on, so it doesn't matter if they control the website the requests go to. If the attacker can eavesdrop on your emails, they can probably eavesdrop on your HTTP sessions as well. Some have recommended disabling PGP and S/MIME completely. That's probably overkill. As long as the attacker can't use the "remote content" in emails, you are fine. Likewise, some have recommend disabling HTML completely. That's not even an option in any email client I've used -- you can disable sending HTML emails, but not receiving them. It's sufficient to just disable grabbing remote content, not the rest of HTML email rendering. An example of this is the following email. This is a standard HTML email message consisting of multiple parts. 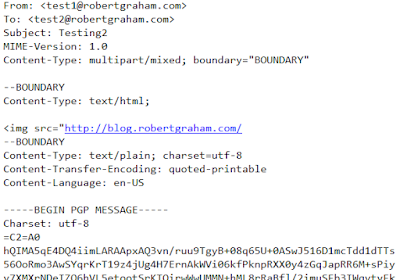 The trick is that the IMG tag in the first part starts the URL (blog.robertgraham.com/...) but doesn't end it. It has the starting quotes in front of the URL but no ending quotes. The ending will in the next chunk. The next chunk isn't HTML, though, it's PGP. The PGP extension (in my case, Enignmail) will detect this and automatically decrypt it. In this case, it's some previous email message I've received the attacker captured by eavesdropping, who then pastes the contents into this email message in order to get it decrypted. That's what you see in the above URL, all this code up to the first quotes. Those quotes terminate the quotes in the URL from the first multipart section, causing the rest of the content to be ignored (as far as being sent as part of the URL). So at least for the latest version of Thunderbird, you are accidentally safe, even if you have "remote content" enabled. Though, this is only according to my tests, there may be a work around to this that hackers could exploit. In the old days, email was sent plaintext over the wire so that it could be passively eavesdropped on. Nowadays, most providers send it via "STARTTLS", which sorta encrypts it. 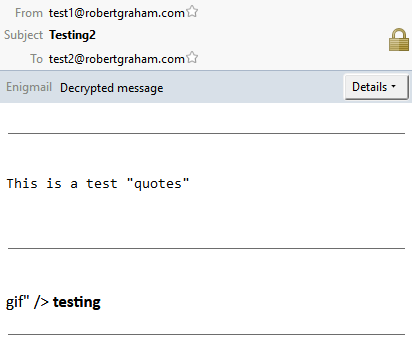 Attackers can still intercept such email, but they have to do so actively, using man-in-the-middle. Such active techniques can be detected if you are careful and look for them. Some organizations don't care. Apparently, some nation states are just blocking all STARTTLS and forcing email to be sent unencrypted. Others do care. The NSA will passively sniff all the email they can in nations like Iraq, but they won't actively intercept STARTTLS messages, for fear of getting caught. The consequence is that it's much less likely that somebody has been eavesdropping on you, passively grabbing all your PGP/SMIME emails. If you fear they have been, you should look (e.g. send emails from GMail and see if they are intercepted by sniffing the wire). If somebody attacks you using eFail, you'll know. 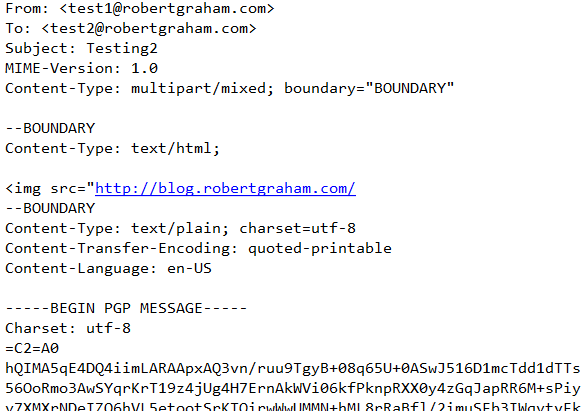 You'll get an email message formatted this way, with multipart/mixed components, some with corrupt HTML, some encrypted via PGP. This means that for the most part, your risk is that you'll be attacked only once -- the hacker will only be able to get one message through and decrypt it before you notice that something is amiss. Though to be fair, they can probably include all the emails they want decrypted as attachments to the single email they sent you, so the risk isn't necessarily that you'll only get one decrypted. As mentioned above, a lot of attackers (e.g. the NSA) won't attack you if its so easy to get caught. Other attackers, though, like anonymous hackers, don't care. It only works if attackers have already captured your emails (though, that's why you use PGP/SMIME in the first place, to guard against that). 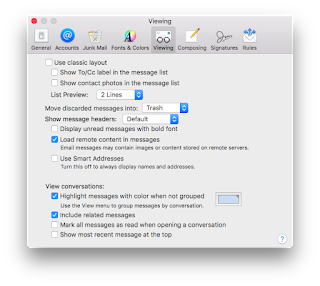 It only works if you've enabled your email client to automatically grab external/remote content. Instead of disabling PGP/SMIME, you should make sure your email client hast remote/external content disabled -- that's a huge privacy violation even without this bug. 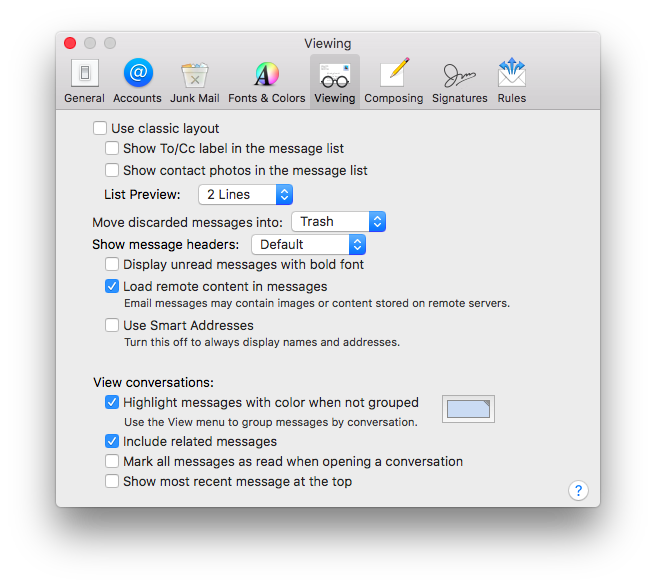 you *can* switch off displaying HTML contents in Thunderbird. this can be either on a global basis in the configuration menu or in the "view" menu, submenu "message body as". The thunderbird extension "Phoenity Buttons" is helpful here: it can add a HTML on/off toggle button to the toolbar.